The Celestia is one of four 11” high Tempflow memory foam mattresses (the others are Eros, Opulence, and Copia). It is also the softest model, with a feel of Extra Plush. As the other Tempflow models, Celestia is a mattress made in the U.S.A. It is comparable to the TEMPUR- Cloud® Luxe by TEMPUR-Pedic, which is being replaced by the TEMPUR-LuxeAdapt Soft. Inside of its patented Kool-Flow™ cover, Celestia has four layers, two of memory foam and two of high-density polyurethane foam. The Kool-Flow™outer cover on the Celestia is a key part of the patented Airflow Transfer System (ATS) described below. The knit fabric is a blend of 43% rayon from bamboo, 56.4% polyester, and 0.6% Lycra (spandex). The top panel of this cover is zippered so it can be taken off and washed. This cover is a thick knit, providing some softness. The inner cover is a fire sock of non-toxic flame retardant material: rayon infused with silica. The 3” Comfort Layer of the Celestia is 5-lb SD Biogreen® Memory Foam, an extremely-low VOCs memory foam. SD stands for “superior density.” Even though this is 5-lb memory foam which is very conforming (hence pressure relieving) because it is highly heat sensitive, it has been engineered to also be very pressure sensitive. This gives it a quick response when it hasn’t yet warmed up, as well as making it plush. It is ventilated as part of the ATS. The 2” support layer in the Celestia is not memory foam, but high density polyurethane foam. This is to bolster support since the comfort layer is soft as well as very conforming. The support layer keeps the sleeper from bottoming out. At the same time, there is still some give, so the support is not harsh. Like the Comfort Layer above, this layer is ventilated to be part of the ATS. In Celestia, as well as in Harmonia and Eros, the Channeled Airflow Layer is separate from the Support Base. In all the other Tempflow models, they are one. Both are made of high-resiliency polyurethane foam. This layer is a key component of the ATS. Channels with a square cross-section are cut into the top surface to facilitate the flow of air to and from the vertical pores in the Comfort and Support layers. This is the primary support for the Celestia. It is 4” of HR polyurethane foam. Celestia has two key features common to all Tempflow memory foam mattresses: Biogreen Memory Foam and the Airflow Transfer System. First, it contains no heavy metals and no Bromine, Boric Acid, PBDE, or TDI. Secondly, its Volatile Organic Compound (VOC) emissions are extremely low, according to the results of testing in an Air Quality Services lab. The total VOCs were 0.039 mg/m³, ¹/₁₃ the CertiPUR-US and OEKO-TEX standards for certification, and ⅕ the strictest standard, GreenGuard Gold. 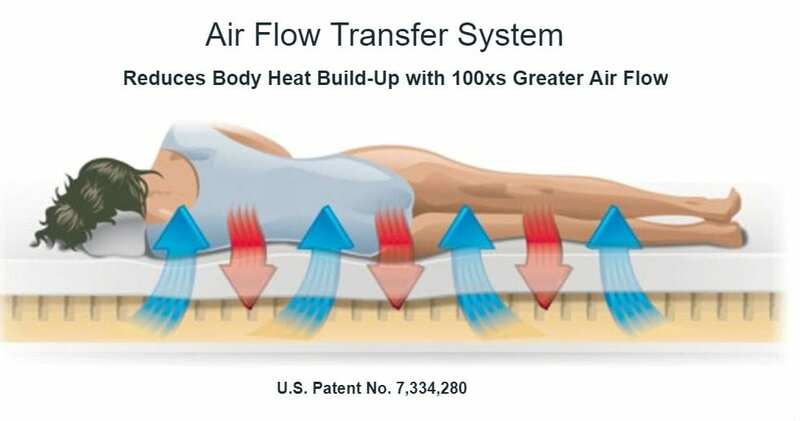 The Airflow Transfer System was designed and patented by Dr. Rick Swartzburg, DC, a chiropractor, to solve the problem of heat retention in memory foam. It is standard in Tempflow mattresses, the Snuggle-Pedic Mattress, and Selectabed’s Flex-Tech Series, and is an option for the Tri-Pedic Series, the Fibro-Pedic, the Soft-Pedic, the Memory Zone Series, and the Air-Pedic brand by Selectabed. The components of the Airflow Transfer System are the Kool-Flow™ cover, vertical ventilation of the upper layers, and air channeling on a lower layer. You can see this at work in this Snuggle-Pedic demo video clip by Dr. Swartzburg. The Kool-Flow™ cover has many micro-vents knitted in. These allow more air to pass through than if it were the knit alone. These are not only on the top, but on the sides as well. The Kool-Flow micro-vents are the in/out ports for the Airflow Transfer System. When the upper layers of the mattress are trimmed to size and put together, vertical holes (pores) are punched through, top-to-bottom. They are not molded into the foam, as is often done with latex. This way the holes in one layer are aligned with those in the next, allowing air to flow unhindered between the top and the bottom of the stack. With so many parallel pores, air can flow both directions at the same time, hot air down and out, cool air in and up. Air flows horizontally through air channels in the upper surface of the lower layer. In Tempflow mattresses, this is either the Base Support Layer or the Air Channeling Layer, depending on the model. The channels line up with rows of pores in the upper layers for the greatest flow of air. Memory foam mattresses quickly gained a reputation for being hot. Manufacturers have used several means to cool the memory foam – at least to keep the heat down. The original memory foam was closed-cell foam, which kept air from passing through. Then open-cell form was developed which let air filter through, but this was not enough. Gel was added to absorb heat and conduct it away from the sleeping surface, but it has its limitations – it can only absorb so much heat. Likewise, phase change materials (PCMs) have their limitations. Gel and PCMs work best if they can transfer heat elsewhere. The oldest and still most efficient way to beat the heat is moving air. The Airflow Transfer System puts together breathable covers with vertical and horizontal airflow inside the mattress for the most effective means of cooling. The Warranty on the Tempflow Celestia is for 40 years, and the Sleep Trial is for 120 nights. The TEMPUR- Cloud® Luxe (and other TEMPUR-Pedic mattresses) carry a 10-year warranty and a 90-night sleep trial. The Celestia does not have an abundance of customer reviews and ratings, even though it has been listed for a long time. One reason is the limited distribution. It is available only online on the Tempflow website, the Selectabed/Tempflow/Air-Pedic showroom, and a handful of chiropractic clinics. It does have a few ratings/reviews on GoodBed and Beds.Org, three mentions in the Tempflow testimonials, and a few recommendations by online bloggers and commentators. Celestia has two reviews on Beds.Org and two ratings on GoodBed. It is the only Tempflow model with less than a 5.0 average rating on Beds.org, 3 stars because of a faulty cover cited in one review. Both of the GoodBed ratings are 5 stars. One compared it favorably with the TEMPUR-Pedic TEMPUR-Cloud Luxe Breeze. The other reviewer has fibromyalgia. This brings up the issue of why so few ratings. Extra plush Celestia is at one end of the firmness spectrum for Tempflow mattresses, while extra firm Essence is at the other. Experience shows that most sales gravitate around the middle of the spectrum, meaning that we should expect sales of Celestia, and therefore the number of reviews, would be less than for models closer to the center. A major pro for the Celestia, and also for the other Tempflow models, is the affordability, especially in contrast to the comparable TEMPUR-Pedic mattress. Also in contrast to the T-P model, it is cooler, even cooler than the Breeze version. Only one customer said it was “too soft,” while others said it relieved back pain and eased fibromyalgia.